The last Thursday of every month from 4:00PM to 6:00PM, we serve a free meal in the Parish Hall. Everyone is welcome, whether they are hungry and need a meal or they live by themselves and just don’t want to eat alone. Each month this meal is prepared by Linda Murelle, Debbie Zurn, and other other organizations from the parish. It is served by a volunteer organization from the larger community. These community groups not only help serve the meal, they help with financial assistance to purchase food, and often bring along some yummy deserts to share! The community groups who help to serve the meal from month to month include Rotary, Board of the Bridge, First Presbyterian Church, Grace Church, Waverly, Sayre Christian Church, and Sayre Area Education Assoc. and Strong Women, Strong Bones. Together we make it happen! Come and join us to eat and if you would like to help either cook or serve a meal, please contact the Parish Office. 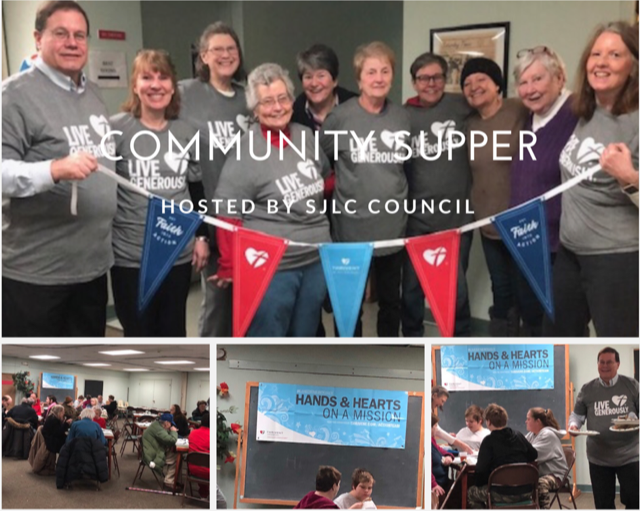 On Thursday, February 28, St. John Lutheran Church and Church of the Redeemer were partners in ministry at the last Thursday of the month Community Supper. Linda Murrelle and Cheryl Bottone shopped for the meal, paid for by Thrivant Financial Services. In the kitchen were Linda Murrelle, Cheryl Bottone, Oliver Young (not pictured) Sherry Gauber and Nina Seebeck. Serving our clients supper were Tom and Deb Brandt, Louise Sackett, Judy Fagner, Sheila Slawta and T. J. Mizener. The tasty menu included chicken drumsticks, mashed potatoes, and green beans. Dessert was ice cream sundaes.